This holiday cleaning tips post is brought to you by Swiffer® as part of a Type-A Parent Community Sponsored Post. I’ll be the first to admit I am always a work in progress when it comes to cleaning. For this reason, I love Swiffer products because they are quick, easy and convenient. Some people are gifted at naturally keeping things clean as they go. For me, it takes a lot of thought and supplies I can grab and use right away without over-thinking it. For the holidays this year, we are traveling to the mountains. There is no dishwasher and a very small kitchen in our cabin so in order to make sure I am not in the kitchen all week, I have a few tricks up my sleeve. These can apply to your holiday week at home too! Use paper products – I generally don’t like to produce a lot of waste, but during the holiday week (especially on vacation) I let this one slide. We will use glass dishes for our Christmas dinner. But most of our other meals will be eaten off paper plates and bowls. Less to wash, more fun to be had. Daily quick sweep – Doing a quick sweep over the floor with a broom and/or Swiffer goes a long way at the end of each day. Truth be told, I want to be better about this at home. But especially at the holidays when traffic is higher and floors never seem to stay clean. Clean as you go – Each time you pass through a room, take something with you and put it away to keep clutter under control. Even items like shoes and jackets out of the way make your home feel so much cleaner! Bonus tip – don’t do it alone! The holidays should be fun for everyone. Don’t get trapped “making it all happen” for the rest of the family. Ask for help and then let them help you! Three people tackling a project takes 1/3 of the time as one person doing it. That’s just science. 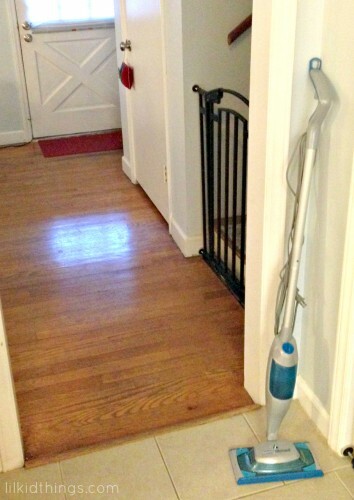 This week, I had the chance to try out the new Swiffer SteamBoost Steam Mop. I already use Swiffer products, but I was curious to see how adding steam would change the process. After using it, I am sold! All you do is add water to the tank and plug it in for 30 seconds and you are ready to go. I felt like adding steam made the cleaning pad last longer and got my floors cleaner. I didn’t think about the fact that there would be a cord following me around, but it is definitely long enough and I did my whole kitchen without changing outlets. I’m hoping that 2014 will be the year of cleaner floors in my house! More than that, I hope to enjoy the holidays with my family and focus on fun more than getting everything just right. I hope you have a very Merry Christmas and a happy holiday week! What are your favorite holiday cleaning tips? This sponsored post was brought to you by Swiffer®. 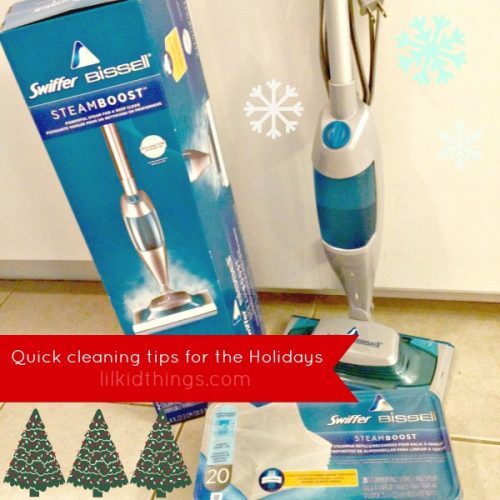 For a limited time, get a $15 prepaid card when you purchase a SteamBoost Steam Mop Starter Kit between 11/24/13 and 12/31/13. Swiffer BISSELL® SteamBoost™ combines a dirt-dissolving cleaning solution with the power of steam for a deep clean that gets messes mops can leave behind. Also be sure to like Swiffer on Facebook and follow @swiffer on Twitter. Easy acorn cookies to make with kids!